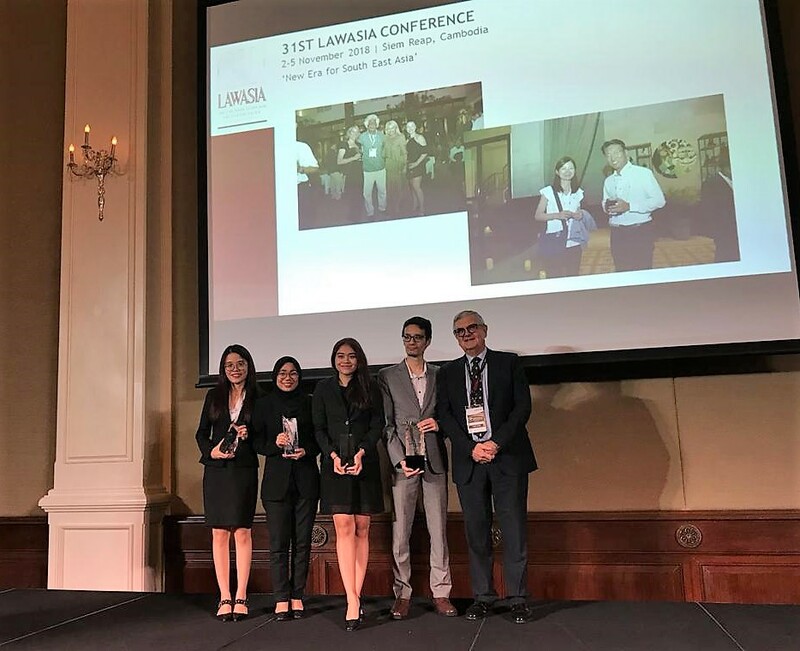 The 13th LAWASIA International Moot Competition held on 1-5 November saw a group of UM Bachelor of Laws (LLB) students raised as the champion. The team comprised of Ms. Lily Sabreena binti Mastura, Ms. Lee Suan Cui, Ms. Nur Aliya binti Ayob and accompanied by their coach, Mr. Raphael Kok emerged as the International Champion after defeating the National University of Singapore (NUS) in the final round, where the 5-member panel awarded the win to UM unanimously. In addition, the team was also ranked first in both the preliminary round and the quarter final round. They also triumphed over teams from India, Japan, UK and China, as well as two of their Malaysian rivals en route to victory. Ms. Lily Sabreena was also awarded the 1st Runner-up Best Mooter in the competition. The LAWASIA International Moot Competition, now in its 13th year, is an annual competition organized by The Law Association for Asia and the Pacific (LAWASIA) and supported by The College of Law (Australia and New Zealand) and the Asian International Arbitration Centre. This international competition aims to recognize the importance of mooting as a systematic training process of problem solving, legal analysis, drafting legal submissions and public speaking. This year’s competition, held at Siem Reap, Cambodia highlighted issues on international trade, commercial law and contract law, and drew participation from law schools from Malaysia, Singapore, the UK, Vietnam, Thailand, India, Japan, Sri Lanka and China.